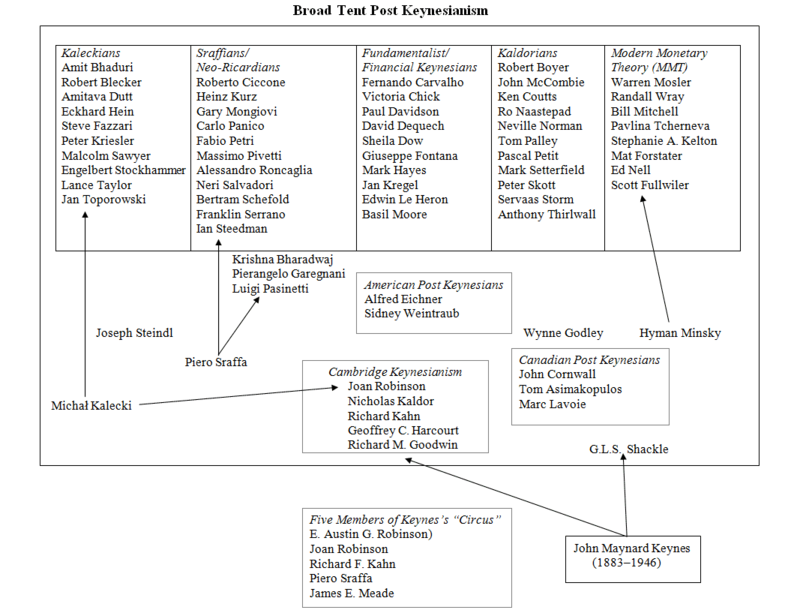 Another proposed diagram, but this time of the subgroups of Post Keynesian economics. My classification scheme comes from Marc Lavoie in this fascinating paper here. My only difference is that I do not regard MMT as part of Institutionalist economics. (1) Should Krishna Bharadwaj, Pierangelo Garegnani and Luigi Pasinetti be included in the Sraffians group or separately as I have done here? (2) Were Roy Harrod, James E. Meade and E. Austin G. Robinson Post Keynesians or did they basically remain neoclassical synthesis Keynesians? (3) Should Wynne Godley simply be listed as a Kaldorian or separately? 1. I don't see why not. 2. Harrod? Yes. Cambridge Keynesian. Meade? No. I don't know about the other two. Harrod reminds me that you should put Evsey Domar in there somewhere too. 3. I think he should. 4. Eatwell is a Sraffian. Tarshis, I don't know. Arestis overlaps but I would say fundamentalist if I was pushed. I don't know Rosser. Keen doesn't strike me as being familiar with much PK economics outside of Minsky. Maybe on his own with an arrow from Minsky. Here are a few comments and a few answers. Some authors are really difficult to put in a box. I agree with Philip Pilkington Eatwell is in the Sraffian strand and that if pressed one could put Philip Arestis in the fundamentalist box, but when asked the latter did not seem to feel at ease with this. Similarly, if Ed Nell can be put in any box, it would be the Kaleckian one, and similarly for G.C. Harcourt. Godley and Harrod should go with the Kaldor box. All three have a lot in common. I wonder why there is a specific box for Canadian post-Keynesians (to whom you could add Mario Seccareccia). In my paper I have put Goodwin with Kaldor because they were both concerned with dynamics and both felt at ease with the assumption of full capacity utilization. If we do this, then Rosser and Keen would be in the Kaldorian box. I do not think it is appropriate to have MMT independent of the Institutionalist post-Keynesians. What characterizes MMT is its institutional description of the clearing and settlement system. My question to you would be:where do you put important PKE such as John Kenneth Galbraith, Fred Lee, Peter Earl and Alfred Eichner? Minsky could go in the Institutionalist PK box or in the Fundamentalist PK box. Thank you very much indeed for this comment: it clarifies a lot of issues. (1) on the "Canadian Post Keynesians" box, I put it in because I was unsure how to classify John Cornwall and Tom Asimakopulos. How would you classify them? (2) Do you think Krishna Bharadwaj, Pierangelo Garegnani, and Luigi Pasinetti should just go in the Sraffian box? (3) Finally, out of interest, how would classify yourself? As for Alfred Eichner, I am not sure where to put him. Did he self-identify as an American Institutionalist? A few points of disagreement formulated as questions if you don't mind, Marc. (1) Is it really fair to say that the main characteristic of Kaldorian economics is being comfortable with full capacity utilisation? I really don't see it that way at all. If I were to summarise I would say that it was characterised by (a) a focus on the real-world of policymaking, i.e. applied economics, (b) paying attention to institutional features such as the financial sector while dealing with this through macro identities and (c) paying close attention to the national accounts. (2) Would Goodwin not be better said to be a neo-Marxian in this regard? (3) I really don't see Keen in the Kaldor box. I don't think that he's even familiar with his work. Keen has got to come straight from Minsky surely...? Fred Lee, although he would most neatly fit into the "institutionalist" school, should be put into a new category: heterodox. Why not? Lee identifies himself as such, and given his work in the past 14 years or so since he's been at UMKC, I don't think it would be appropriate to put him under any of those lists. But he was originally a (self-identified) Post-Keynesian so you could very well put him wherever you put Eichner. As for Bharadwaj, I don't see why you wouldn't list her as a Sraffian. Asimakopulos at first blush I would think is Kaleckian but I haven't read all his stuff. Garegnani identified as a "marxist" but you could put him in the sraffian camp. Pasinetti is difficult, I wouldn't put him anywhere except "other". Lavoie is Kaleckian. All these comments show that putting people in boxes is no simple task. Cornwall goes with the Kaldorians. Keen could be put with Minsky; but where does Minsky go? I had initially put Minsky with the Fundamentalists (on the basis of his 1975 book). 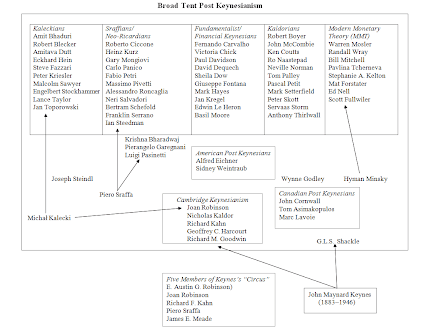 If one wishes to keep a separate MMT school (a mistake in my view, as it focuses more on the form than the content),then it would make more sense to include Kregel in it. Bharadwaj, Pasinetti and Garegnani go with the Sraffians: there is no doubt about this. Pasinetti has simply a different interpretation of Sraffian economics from that of Garegnani. In fact, Pasinetti is the last defender of the labour theory of value. Yes, Goodwin is closer to being a neo-Marxian than a post-Keynesian, but if I remember well Harcourt puts him among PK economists. Ed Nell is also someone who is really hard to put in a box. He did a lot about Sraffian economics, and he showed some sympathy for Lerner's functional finance, but in my opinion, most of his work is closest to Kaleckian economics. Heterodox is only meaningful as a general identifier. There are about 20 different heterodox schools of thought, and that is when counting all five strands of PKE as a single school ! As for Garegnani, Pasinetti and Bharadwaj, the answer to your question is a firm "yes". Garegnani was the main custodian of Sraffa's paper, that says it all. Bharadwaj turned to study the classics only after she read Sraffa. I would also include Pasinetti as a Sraffian (he identifies himself as one, as far as I know). Cornwall was a Kaldorian, in my view. He emphasized the endogenous character of productivity, which is a distinctive feature of many Kaldorians (like Servaas Storm and Ro Naastepad, who were on the list).